Massage therapy is a lot more than just feeling good, it’s actually beneficial to both physical and mental health. And just like any other spa treatment at WaySpa online marketplace, the more you do it, the better it gets. We must keep in mind that our feet shouldn’t be neglected. After all, they’re taking us places and carry us around in all types of (un)comfortable shoes. That’s exactly why taking some time off and massaging your feet is worth trying out. You can do it yourself, ask a friend or your partner, or get it done by a professional. Foot massage is a special technique of treating your feet and a simple, yet effective way to a better health. Before getting one, we should all acknowledge the great health benefits it offers. There are many bone and muscle injuries that can be treated with massage therapy. According to your doctor’s advice, if you have a foot injury, getting a foot massage can help speed up the recovery. A foot massage can also help with other foot conditions such as flat feet, toe pain, common forms of arthritis, plantar fasciitis or even restless leg syndrome. It’s a great way of eliminating the pain and preventing foot and ankle injuries by keeping your feet strengthened and flexible. All types of massages stimulate the flow of blood and lymph vessels, thus improving the blood circulation. If you have blood circulation issues, you definitely need to book a massage appointment at your nearest spa salon. A poor circulation can cause a lot of health issues, so even having cold feet is a reason enough to get a foot massage. Foot massages are proven to be helpful when it comes to treating anxiety and depression – just a 20-minute session can reduce anxiety symptoms and provide an energy boost. There are many ways of treating these mental health conditions naturally, and massage therapy is one that’s absolutely worth trying out. Hypertension, or commonly known as high blood pressure, is a chronic disease that could lead to serious health issues such as cardiovascular diseases and stroke. Regular massage treatments can lower the blood pressure and help you prevent and treat these conditions the natural way. Migraine headaches are awfully irritating. Often being chronic, there isn’t really a definitive cure for these types of headaches, aside from easing the pain with medication. Another way of treating headaches without involving too many chemicals is massage therapy. A good foot rub can help relieve the pain by decreasing stress – the number one headache trigger. Just by being so soothing, relaxing and stress relieving, massage therapy can help you overcome some sleep disorders and insomnia. Sleep insufficiency could cause serious health issues, so instead of reaching for the usual sleeping pills, you might want to give reflexology a chance and finally develop a good bedtime routine. Foot massage can help treat your disturbed sleep by stimulating some pressure points on the feet that could give you a good night’s sleep. 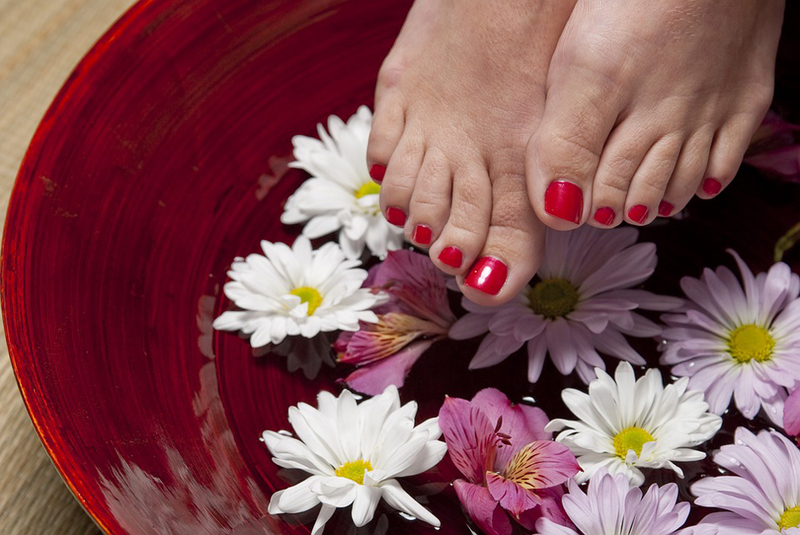 Foot massages include the application of rich moisturizing lotions and essential oils. Massaging your feet regularly will help you get rid of dry skin, cracked heels and maintaining healthy, pretty feet. On top of that, essential oils like tea tree, lavender and eucalyptus have some powerful antifungal and antibacterial properties that will surely prevent any bacterial and fungal infections of the skin and nails. PMS symptoms include conditions like bloating, cramping, headaches, fatigues, irritability, mood changes and anxiety. The healing effects of reflexology can help ease these symptoms and a daily foot massage can even reduce the intensity of the menstrual pain. Edema is the medical term for swelling in the feet and ankles due to the retentions of the fluids in the body. These symptoms appear after standing or sitting for a longer period of time, and are mostly common during pregnancy. A daily foot rub can help you heal your swollen feet and ease the discomfort. Foot massage is a great way of rejuvenating and instantly boosting your mood. It’s a deeply relaxing and therapeutic experience that will make you feel recharged and energized. Having your feet massaged a couple of times a month is quite essential for your emotional state and finding your peace and balance. Author Bio: Ana Arsovska is a beauty blogger, makeup lover and a skin care enthusiast. When she’s not creating DIY projects and sharing makeup reviews on her blog 365beautytips, she writes about fashion, style and she’s blogging on other websites.